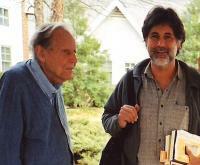 In the late spring of 2005, southern nature writers John Lane and Thomas Rain Crowe traveled together to the home of ecologian Thomas Berry, at Wells Spring Assisted Living Center in Greensboro, North Carolina. At 91 years of age, Father Thomas Berry is one of the most profound, if not most celebrated, spokespersons for the preservation of the environment in the English-speaking world. His books The Dream of the Earth, The Universe Story and The Great Work are a liturgy of that place where theology and ecology connect. (The term “ecologian” has been coined in his honor to emphasize the marriage of these two disciplines.) Lane and Crowe went with the hope of getting some answers to questions about how southern nature writers should be working to help resolve current imbalances between the human and the natural worlds, as well as questions pertaining to how we (the human race) fit into the larger universal paradigm of connectedness and balance as set out by Father Berry in his books. Questions about place (the Southeast) and community activism were very much on their minds as they drove from Lane’s home in Spartanburg, SC, up Interstate 85 that warm spring day. They arrived bearing gifts in the form of questions such as “How do we live and work with our neighbors, in place, to make the ‘universe story’ functionally effective today.” Lane was especially interested in Mr. Berry’s responses to questions pertaining to “faith,” and especially Thoreau’s idea of “faith in a seed,” going into this conversation with the great man. Following national elections the previous fall, Crowe was still thinking politics, and wanted to hear Mr. Berry’s take on where he thought the environmental movement, the Green Party, and activist nature writers in all parts of the country needed to go. While looking for insights into “the local,” as one might expect, they came back from their visit with Father Berry largely with illustrations and illuminations of the bigger picture,. A good deal of the time the two writers spent with the elder man was spent discussing the issue of the “cultural mandate” of the evangelical Christian movement and the scriptural mandate supporting the idea of the subduction of the earth and its creatures by mankind. Father Berry also laid out his “plan” of attack in responding to religious fundamentalists, as well as to the notion of “the failure of the Environmental Movement.” All in all, what we have, here, is vintage Thomas Berry. The universe is always present in what we do in our homes, communities and bioregions, and our homes and habitat are always a part of the workings of the universe. Addressed and articulated in accessible language, yet profoundly said, Father Thomas Berry speaks to us about “the great work” we are called on to do today in the face of almost overwhelming odds. John Lane: I have been involved for about five years with a group that’s been meeting on Ossabaw Island off the coast of Georgia, and talking about Southern nature and writing about the natural world of the South--writers such as Janisse Ray (from south Georgia), Franklin Burroughs (a writer from Maine who grew up in Conway, SC, Thomas Crowe (from up in the NC mountains), Jan DeBlieu (from the Outer Banks of North Carolina), myself (from the Piedmont of SC) and a few others. This time when we were on Ossabaw, we began to talk more about how odd it was that none of us were church-goers, but that we’d all grown up in the protestant church in the South and how we felt after this last election that the language and the experience of the church and protestant Christianity, in particular, has been taken away from us by the latest election. And so we began to talk about that and as we were driving back from Ossabaw, Thomas and I said to each other that we had to come talk to you about all this. We want to ask you some questions about where we’re going and how what’s happening now fits in with your story, your “Universe Story” and also to ask you about your experience as a southerner. You were born in the South and we’re not sure if anyone’s ever talked to you in detail about your being a southerner and your relationship with the land and what the South has to teach us. Thomas Crowe: How did you feel in November--after the last presidential election? Were you hopeful about the election--going into the election? Thomas Berry: I was hopeful, but… Well, let me just say that it’s amazing that a president would speak the way this one speaks and to make the kind of judgments that he makes. It’s difficult to know why so many people follow him. I guess I really don’t know what’s going on today, and what people in this country are thinking. I don’t know if Bush won North Carolina in the general election or not, but I’ll tell you one of the tragedies in this part of North Carolina where I grew up. I was born here in 1914. November 9, 1914. So I was born when this city (Greensboro) was only 15,000 people. It was a small southern town. Real small. Of course at that time the twentieth century was just beginning. The automobile had just come into being (the Ford company was founded in 1903, General Motors in 1908). So, I was born just as industry was taking place. Roads were being built and all of that. JL: What was this area of the Piedmont like in 1920, when you were growing up, when you were a boy? Thomas Berry: Well, there was much more animal life! Frogs, deer, and birds in particular. That’s one thing I remembered. Never ran into many wolves, as they were pretty well gone at that time. I did walk in the woods a great deal when I was a child. Already, the woods and nature were the most important things in my life. By the time I was ten or eleven years old, I had a feeling that something was wrong. I didn’t, of course, have the least idea of what this was all about, but I grew up with the felling that I couldn’t trust the developing industrial world in which I was living. JL: Do you think that feeling might have been different if you had been born in New England, or Oregon, or Kansas? Thomas Berry: That’s hard to say. America can possibly be considered the first of the nation states. In Europe, the nation states, like Germany, didn’t come into being until the 1860s or 1870s. There was really no France, no Italy until about that time. People think that there was always an Italy and Germany the way it is now. Germany was four different states until the nineteenth century. This country took almost immediate leadership. It was dramatic. This new thing called “democracy” took a lot of nerve. And they couldn’t really have known what they were doing. It was really the first time that a government of the people really took hold. And the modern nation state came into being. TRC: Do you think that the tension between the nation state and the things that allowed this to happen to the natural world was connected? Did nationalism contribute to the beginnings of the destruction of the natural world? Thomas Berry: Definitely! That was what brought devastation, because the nation state came into being as a kind of almost religious sentiment. To this day, it’s as profound a “religion” as most people have in this country. The challenge that developed as a result of the establishment of nation states was the challenge of the industrial control over the natural world--based on the discovery that we could exploit the natural world and we could make money off of it. The real anomaly of this country right now is that it has such contradictions. We’re the richest country in the world, and we should be the one with the highest and most moral sense of “nation.” But, if you look at something like our prisons--we have many times more people in prison than any of the other modern nation states. We have ten times as many prisoners per population as say, not China, but Japan. And two or three times more than most countries of Europe. Our young people are growing up in a very very insecure world. We spend, I believe, as much money on defense as the next twenty nations. Our defense budget is in the trillions! We used to think a billion was something, but now we’re into trillions. JL: Before I left home this morning, I ran into our chaplain at Wofford College where I teach, and I told him we were coming to talk to you. He’s read your work and loves your work and said, “be sure to ask him what he thinks about the development of the evangelical movement in the last few years. He says there is a doctrine that’s developing in some evangelical churches that’s called “cultural mandate.” This “cultural mandate” is apparently all about subduing the earth. There is an actual mandate within the evangelical church that says that the relationship between the church and the earth should be one of subordination. Have you heard about this and have you thought about it? Is that a disturbing development to you? Thomas Berry: I’ve heard about it. To subdue the Earth? There are churches wherein this is a developing doctrine now. It’s about subordination rather than finding a way to become better stewards. We need to be finding more ways to learn. In fact, the more precise translation of the contemporary biblical passage which modern man is familiar and that says “And man shall have dominion over all the land” is really closer in translation to “And man shall be steward to the land.” I would say that this whole direction by the contemporary church is a total misreading of the Christian religion as well as all other religions. All religions are founded on our experiences with the earth and the universe. St. Thomas, a great thinker in the Catholic tradition, lived in the thirteenth century, but is still a wonderful teacher, and his teachings are still available to us. He always said that the universe symbolizes the hopeless perfection in things. One can look at it this way: From the standpoint of existence, the divine is primary, and the universe is derivative. On the order of human knowledge, the universe is primary and the divine is consequential. The very nature of religion robs itself of the perception that the universe is not self-explanatory. JL: What happens when religions get it wrong, though? What are the consequences? Thomas Berry: Well, you have to say this: The most basic weakness of Christianity is its tendency to overdo the concern for redemption, and to take away from the idea of creation. There seems to be always a tendency to think that the universe is somehow deceptive. That the universe is going to betray us. JL: So, how do we read this landscape that’s being decimated by developers as a creative landscape? Rather than wanting to “redeem” it and at the same time not wanting to save it? I don’t know if you’ve seen or heard the recent “news” on the failure of environmentalists. “The death of the environmental movement,” some have said. Thomas Berry: They are saying, the opposition that is, that the environmental people are missing the point somewhere. That is quite terrible. They (the nay-sayers) are missing the point of the larger issue. And one of the ways they are missing the point is that they don’t understand how the human mind functions. How the mind functions is how humans function. Humans can be described as “that being in whom the universe reflects on itself in a conscious mode of self-reflection.” We humans actually enable the planet Earth because we are members of the planet Earth. We enable the Earth to reflect on itself. We’re doing a terrible job with what knowledge we have. It’s not that the knowledge is wrong. It’s that we don’t know how to use it. This is one of the basic failures of science. Science does not instruct us on how to use science. JL: So what you are saying is, that as we drive through the landscape coming from Spartanburg, or Asheville, on the way to Greensboro, where we are today, we see a landscape that is being shaped by people who have not been taught correctly? That there’s a missing piece? A reflective piece? Thomas Berry: I have the idea that there are four basic “establishments.” The controlling orders. The political, legal order. The economic order, which is the economic industrial world. The world of education. And the world of religion. These four establishments are the power establishments in the world today. These people have authority on a broad scale. And all four of these “orders” are failing because they don’t understand the proper relationship with the natural world. Thomas Berry: This “proper” relationship is the determining relationship of all forms. It’s a primary structure that determines true law. I have conceived of a new organization of law that I established three or four years ago--of people from Africa, Europe, North America (the U.S. and Canada) and South America--based on a meeting I had with representatives from all four of those continents. The basic idea that I proposed and built on is, that every being has rights. For humans to think that they are the only beings that have rights is a fallacy. This kind of thinking is a disaster! To think that we have certain rights to intrude upon the living things and that the other beings don’t have rights, this is a sacrilege. Every being has rights! Every being has free rights. JL: What do you see as those rights being? Thomas Berry: The right to be. The right to habitat. And the right to fulfill one’s role in the great community of the cosmos. I don’t see how anybody could argue with these rights. I mean, for humans to think they are the only beings that have rights is just silly. All things get their rights from existence. From merely existing. This is something that humans don’t understand very well because they don’t understand language. Most of our problems are, to a large extent, linguistic. We don’t know how to think and we don’t know how to use language. At the present time scientists think that the scientific approach is the only language that is valid. The difficulty, here, is that science is claiming truth, and it doesn’t really think anything is truth except science. In truth, if I may so bold as to use the term idiomatically, that’s why analogous thinking and imagination are the only way in which important things can be known. What does not enter into the conversation of scientists is the area of consciousness, which is more traditionally known as “cosmology.” Cosmology, from the root cosmos, means “universe. Logos means “understanding.” So it’s all about understanding the universe. But you cannot understand the universe in scientific language! You cannot understand the Universe in scientific language! TRC: So, where does the authority of the writer, the creative writer, fall within the realm of the categories that you have laid out--political, economic, educational, religious? Thomas Berry: In all four. Writers and poets are important because we have to know how to speak about the earth. Going back to what I was talking about before--every being has rights. The reason why people can’t appreciate that is because rights are analogous. Not univocal. A tree has tree-rights. A bird has bird-rights. The rights of a tree would be no good for a bird, but the two rights exist. It’s the poets, the nature writers who help us to understand and appreciate these similarities and differences. JL: What if the two rights are conflicting? Here’s an example: Our house in Spartanburg is situated on a vast flood plane. We don’t own the flood plane, we own three acres on the edge of the flood plane. Another man owns the flood plane and there are eighty-year-old hardwoods in the flood plane. Well, in the last ten years beavers have come back into the area and they have dammed the creeks on the flood plane and all the hardwoods are dying. All those eighty-year-old beautiful hardwoods have been growing there with their “tree rights.” How do I convince my neighbor not to trap out all the beavers, or how do I convince him that the hardwoods aren’t as important as he thinks they are in his small , brief look at time? He’s saying “those hardwoods are money to me if I decide to cut them, and those beavers are killing them, therefore I’ve got to kill the beavers.” How do you deal with “rights” when they are that complexly laid out, with two different, three different species--homo-sapien, whatever the beaver species is, and seven or eight different temporal hardwoods--growing in this site? Thomas Berry: Well, you have to go back to some basic ideas that belong to cosmology. That every being has rights. The beaver has rights. But, at the same time, every being has responsibilities. No being supports itself in isolation. Every being is nourished by something outside itself and every being is part of the great community of a self-supporting complexity of being. In this reality, they not only have the right of existence, they have the obligation to support other life, even with their own life. So, this all works out in the natural world. Beavers have forever been killing trees. Our disturbance only goes back two hundred and thirty years in the Piedmont. Beavers have been here for a lot longer than that. We humans have eliminated the things that would normally take care of the beaver. The beaver would not naturally overpopulate and that’s one of the magnificent things about the natural world. It has its own discipline. It’s own balance. And it achieves this in one way or another. If humans step into the beaver’s territory and destroy that balance, then humans need to take responsibility for it. What has happened is humans have taken upon themselves more than they can deal with. Or would like to deal with. We don’t want to have to deal with any of this. We just want to keep exploiting things forever and ever and ever. TRC: Where is our responsibility in all this? How can the nature writers in the South have an impact on this dynamic of exploitation? Thomas Berry: Now, we’re talking about the young people. When I talk about younger people, I mean that the 21st century has to be the opposite of the 20th century. The 20th century has already destroyed itself. It has frightened the world that it has made. Nothing is safe. People are troubled . They don’t know how to behave. In a country like ours, it’s not easy for children to grow up because parents are frequently not a home. It’s a difficult thing raising children in these times, and you can’t blame only the parents. We’ve made victims of the forces that would provide the guidance of an acceptable way of life. So going back to what I was saying about science: You can’t raise a child scientifically. Thomas Berry: You raise children with poetry and imagination. You raise children with a broad range of intellectual experiences. They respond to these and to the natural world--its birds, trees and plants. I’m not convinced that children are all that happy with the gadgetry that they have these days that pretty much take the place of experiences in nature. Rooms full of gadgets. They may be occupied, but not necessarily happy. You cannot raise a child scientifically. You raise children with poetry and imagination. JL: I want to get back for a second to your book The Dream of the Earth and something you’ve written there that I’ve always loved. I want to hear you expand on it a little bit. You’ve said “we have returned to our native place after a long absence.” You’re a native North Carolinian. Are humans restricted in their sense of nativeness? Can you be native to a place like Greensboro and also be native to the Earth as a whole? For instance, salamanders are only native to one particular watershed…. Thomas Berry: We’re native to both. Everything belongs. Everything is a being of the universe. In other words, every being is a “universe-being.” Every being is also a local being. But being limited and local has universal consequences. Fidelity to the local and to the universal is the same thing. But the primary base is the local. We don’t breathe the air from Canada, here in Greensboro, we breathe it from where we are. We drink the water where we are. We have our life experiences where we are. We choose and buy our clothing where we are. Every being is a universe being. Every being is also a local being. Fidelity to the local and to the universal is the same thing. JL: Does every place, every particular place, have its own lesson about the universe? Thomas Berry: Birds and animals work out their relationships within the larger context of the universe, but that frequently varies from animal to animal, or from species to species. In terms of diversity, humans have a kind of comprehensive over-view of things. Often we can get lost in this expansiveness and neglect the local. In a sense, we get over localized. We need to have some people, who live more restrictive lives and, at the same time, people living more expansive lives. JL: What are some of the warning signs, if you’re living and thinking too locally? Thomas Berry: Signs for living too local would be: dissatisfaction and lack of fulfillment. We all need a certain range of diversity in our lives, and this varies from individual to individual. Some of us need an expansive experience early on. Others, later in life. But in general, only recently have we discovered the universe that lies beyond the Earth. To properly answer your question, the course of human history has to be taken into consideration. And along with this, the acceleration of our learning process. What has happened with science is that a deluge of information has suddenly descend upon us. And we’re using it in a wild and destructive manner. JL: This makes sense. As we have discovered more of the universe, have we, then, lost perspective on the local, or are we discovering more of the local as we struggle to gain a more balanced perspective? Thomas Berry: Well, they should support each other. The broader sense should enhance the local, and the local has a need for the broader, just as different periods of history have a different range of expansiveness. Now, we’ve expanded out into the universe with our sciences and that has given us experiences that we’ve never had before. As long as science functions within an acceptable cosmology, the universe and the planet Earth is safe. As soon as science thinks that it is the cosmology, the planet is in danger. And right now we’re not functioning within a non-destructive developmental context. It’s really a question of cosmology knowing how to relate to science. For science doesn’t know how to relate to itself. Right now, ironically, our sciences are causing our lack of health, for example. We could be doing so much, but our children are not as healthy as they should be. 70 per cent are overweight. We’re not a healthy people, and neither are we a well-behaved people. Our president has the illusion that he can force people to do what he wants them to do, by force. JL: You were talking about analogies earlier. Here’s one of the things that I was thinking about before I came over here today: What sort of particular local metaphors or analogies for living can we find? What kind of healthy life can we find in a landscape like this, the Piedmont? Thomas Berry: Well, what is desirable is thinking of the land, the appreciating of the land, the enjoying of the lands, understanding the lands. In other words, the ideal is to shape a meaningful life and particularly for our children. The ideal is to shape a meaningful life and particularly for our children. JL: I have another question about the natural world. Here in the piedmont of North and South Carolina, there is a book called The Naturalist Guide to the Piedmont by Michael Godfrey. In it he says that the primal piedmont--the original piedmont before Europeans arrived--is utterly gone. We’ve utterly destroyed it. My question is: If this is true, if we’ve lost that primal piedmont, what have we really lost? What’s been lost once we’ve lost wildness? Lost a whole landscape that our children and our grandchildren probably won’t experience. With Wal-Marts replacing farms, have we lost our souls? How do we go forward and make this century better than the last if we can’t bring that wildness with us? Or can we, do you think, bring that with us? Thomas Berry: Never again will it [the wildness] be the way it was. To some extent, nature does have a wonderful capacity of recovery, of restoration. While the 20th century will never exist again, new things are capable of developing. But it will not be the same and will not resemble the Earth’s original wonder and beauty. The mind of the child to a world of wonder. While the stars ring out in the heavens! This is a verse that gives expression to the mind, the imagination, and the emotions. These are three aspects of the human function that are involved in almost all phases of integral human development. So, when we are looking for what to aim at in the future, it is to start with the universe and ask: What are the needs of children? What does it mean to be human? To shape a world that responds to these questions, is what is needed. And a natural world gives us these. JL: Talking about children is a good place to ask some questions about population. When you were a child growing up in North Carolina, there were less than two billion humans on the planet. And as predicted, the world’s population rose to 6.5 billion in about twenty five years. This all happening in your lifetime. The South is the fastest growing region in the country. Can the South survive? Can we, as Southerners, survive this population boom? Thomas Berry: I don’t guess I think we can. It would be very difficult to survive with that much population. It goes against all odds with regard to carrying capacity. And it’s here that religion has been at fault. Especially the Catholic religion--which has failed extensively in not paying attention to the decline of the natural world, and in this way it’s losing its own foundations, because the biblical world is thoroughly cosmological. Rituals are cosmological. They presuppose the universe. I was in a monastery for ten years. I didn’t even come home to Greensboro, where my family resided, during that time--between the ages of twenty to thirty. In the monastery, we’d celebrate dawn with prayers and meditations. And we’d celebrate the mid-day, and celebrate the early evening. At vespers, we’d celebrate the early evening, and then the late evening, which was wonderful! Then I’d get up at two-o’clock in the morning and I’d have these experiences with hymns that would be sung according to the time of day and seasons of the year. The whole of that monastic literature was woven into the cosmological cycle. The scriptures, the book-of-songs was thoroughly cosmological. In the normal Catholic world, a person cannot even study theology, or philosophy, or about the universe. This is a part of the comprehensive failure. To recover, we need new laws. We need new religions. New economics and new education. All four. None of the four can do it by itself. I would like to be able to structure a college program based on these principles. This might be a good beginning. John Lane is a member of the Southern Nature Writers group and an avid kayaker. His writing has been published in American Whitewater, Southern Review, Terra Nova, Fourth Genre and National Geographic. His books include Waist Deep in Black Water, several volumes of poetry, and Weed Time, a gathering of his essays. He is an associate professor of English at Wofford College in Spartanburg, South Carolina. Thomas Rain Crowe is a member of the Southern Nature Writers group and an avid gardener. He is the author of several books of original poetry and translation, as well as three anthologies. His back-to-the-land memoir Zoro’s Field: My Life in the Appalachian Woods was published in the spring of 2005, and is the winner of the Ragan Old North State Award for Nonfiction. He is the publisher of New Native Press and lives in the Tuckasegee community of Jackson County, North Carolina.